You must have heard about virtual reality and its increasing popularity. You must be aware of the fact that one needs to wear some kind of the headset to see the objects. 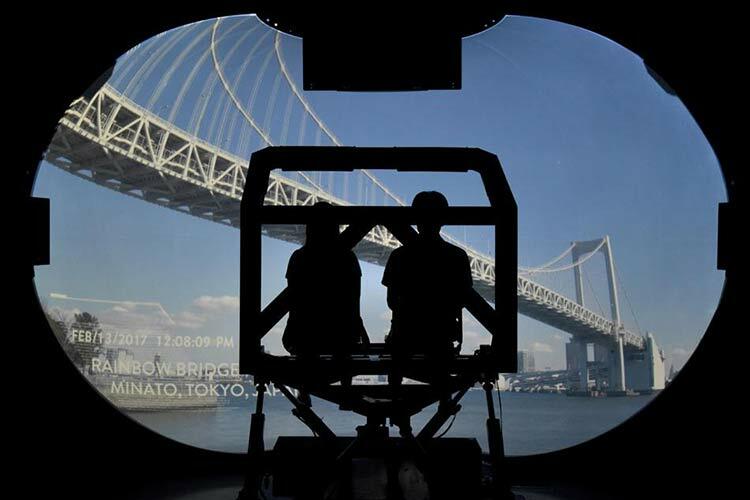 But, now Japanese engineers have developed a system that allows the user to experience without wearing any headsets. The virtual reality “Space Ride” creates a sensation that users are flying through the air inside the giant glass ball. The “8k: VR Ride” resembles a cross between the theme park and an IMAX theater. The users are placed on two swiveling, elevated chairs in front of a semi-spherical screen which engulfs their field of vision. The users can see the images coming closer to them physically on the screen which is completely different from the flat screen display. The system is comprised of a hemispherical theater and a screen which is about 5.2 meters tall, 2.4 meters wide and 2.6 meters deep. According to one of the members of the team, this new system will create a much better experience than the conventional Virtual Reality technology. The users will be able to actually feel the things rather than just viewing them. This technology will also eliminate the need for any kind of the headset which can serve as the big advantage. This technology is scheduled to be displayed at the Japan’s Digital Content Expo 2017 which is scheduled to take place in October. This system is developed by Wonder Vision in collaboration with NHK Enterprise and NHK Media Technology. The development of this technology clearly suggests that in future we might be able to view all things in VR without using any kind of the headset.